Known For: Crokinole videos on Youtube and enthusiasm for the game. Club: Soon to join the Waterloo Crokinole Club. Profession: Student - Business and Math @ WLU and UW. Style of Play: Offensive Favourite Board: Official WCC board. Singles or Doubles: Singles. It is a head-to-head competition, literally. With no partner to rely on, it is as much a battle with yourself as it is against your opponent. The most deserving player will come away with the victory. Favourite Shot: The Rebound 20, although it is a shot I rarely make. Other Hobbies: Video Editing, running, tennis, volleyball. 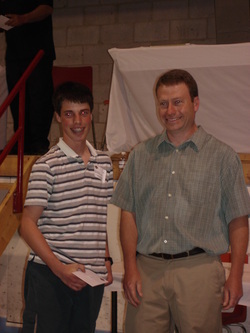 Introduced to the game by his parents by the tender age of 6, Nathan quickly showed his passion for crokinole. By the age of 12 Nathan’s crokinole idol (Joe Fulop) had him playing in competitive tournaments. Nathan thanks Joe for his mentorship over the years, and his continual interest in growth and development of the game. Not to mention his starring role in the Crokinole Movie, and his authorship of the first book written about competitive crokinole. Nathan fears no competitor, but does note that he pays strict attention while playing Brian Cook and Kent Robinson. Brian had his number in the 2009 WCC Final and Kent only seems to have a bad game when Nathan is playing worse. When it comes to goal seeking, Nathan has his eye on the WCC Singles Title and the NCA Tour Title. In his short career as a competitive crokinole player his achievements prove that his goals are within reach. Nathan is also hoping the NCA and the game of crokinole continue to grow and that soon there are tournaments in every province.